Summer is all about the grill. 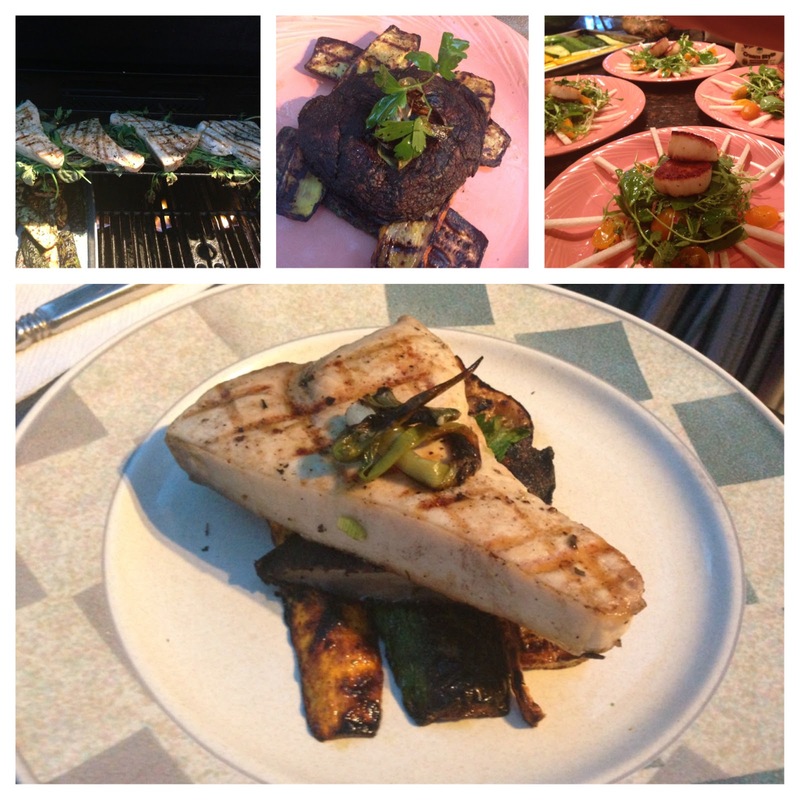 This Sunday cook out included some fresh cut swordfish steaks that are about as good as it gets for fish on the grill. Just be careful not to over cook them as it becomes very dry if not a perfect medium. I also threw in a scallop salad appetizer to keep the seafood theme rolling. This whole meal costs about $80 and feeds 6 people, total prep and cook time was about and hour and a half. I simply coated the swordfish and vegetables in a mix of olive oil, salt, pepper and fresh herbs including marjoram, parsley and tarragon. Grill all veg and fish on high heat. Let fish rest on the top rack for 5 minutes. Toss all ingredients together. Season scallops with salt, pepper and olive oil and sear on high heat for 5 minutes on each side. I also threw in a vegetarian dish of grilled vegetables and portabello mushrooms for Michal. Thanks to Danette, Harout, Michal, Linder, and Michelle for the company. Buon appetito!! Indeed summers are all about outdoors and bbq parties thank you for sharing your idea definitely going to try it with my family in our next bbq. Finally, summer is round the clock so do the steaks. Summer comes along with the never ending temptations for steaks. A great round of applause for posting such helpful recipe. This amazing recipe is surely going to be the cheery to the pie in all the outdoor bbq parties.